It’s tragically ironic that the country that houses the near-2,000-year-old Colosseum, along with numerous other millennia-old structures, is also responsible for infrastructure that it is crumbling after a mere five or six decades of being built. As of late, this sorry state of affairs has come to a head in terms of public backlash. Protests intensified in Northern Italy at the start of the year, with the cause of contention being the construction of a 270km rail line linking the French city of Lyon with its Italian counterpart, Turin. The Treno Alta Velocità (TAV) will include a 57km tunnel under the Alps, which will be one of the longest rail tunnels on the planet. With an expected average speed of 200km/h, the line will significantly reduce transportation time between the two European nations. The TAV also promises to cut carbon emissions and the use of fossil fuels. A mountain rail route that opened back in 1872 first connected Lyon and Turin, but in spite of some improvements over the years, speed and load weights have remained largely restricted due to topographical challenges. Then, in the early 1990s, came plans for the TAV, with promises to make trade cheaper and more efficient for both countries. Now in full motion, the cost of the €25bn ($28.38bn) project is being split three ways: Italy will foot 35 percent, or €8.6bn ($9.76bn), of the cost, with France paying 25 percent and the EU the remaining 40 percent. But despite its publicised benefits, the project has received its fair share of animosity from both the public and various politicians. For many, it has been hard to swallow a multibillion-dollar bill when the country’s economy continues to falter (see Fig 1) and renovations to existing infrastructure are desperately needed. And herein lies the problem – as explained by Enrica Papa, Senior Lecturer in Transport at the University of Westminster: “There has never been a culture of planning and maintenance of public assets in Italy, especially transport infrastructures”. The anguish of protestors in Turin is understandable given recent events that have come to epitomise this culture. One rainy day last August saw the horrifying collapse of a bridge in Genoa: a 50m-high section came crashing down onto the buildings and vehicles below, killing 43 people and plunging massive slabs of reinforced concrete into the riverbed nearby. As news spread around the world, the governing coalition in Italy – comprising the League and the Five Star Movement – cast blame on Autostrade per l’Italia, the private firm responsible for the nation’s motorways, calling for a €150m ($170m) fine and the withdrawal of its contract. Astonishingly, the Morandi Bridge, which was inaugurated in 1967, was the 12th bridge to collapse in Italy since 2004. Five bridges fell between 2013 and 2018 alone. But it’s not just this particular type of infrastructure that is falling apart and causing untimely fatalities: in 2009, for instance, numerous homes in Messina were swept away in floods and mudslides, killing 37 people and injuring a further 95. Despite the area being a high-risk area for hydrogeological activity, with landslides taking place repeatedly over the years, nothing was done until it was too late. In Italy, this kind of story has become all too familiar. When news about Genoa broke, conflicting information was spouted from various parties. For example, Stefano Marigliani, the motorway operator official responsible for the area, told Reuters that the bridge was “constantly monitored and supervised well beyond what the law required”, and that there was “no reason to consider the bridge dangerous”. It was also reported that restructuring had been carried out in 2016. However, according to The Straits Times, Angelo Borrelli, the head of Italy’s civil protection agency, said he was not aware of any maintenance work on the bridge. This discrepancy alludes to a bigger, more entrenched problem. Italy’s infrastructure woes find their roots in a construction boom that occurred in the 1960s. “At the end of [the Second World War], Italy was a country on its knees: 50 percent of the residential estate had been destroyed; more than 60 percent of the industrial assets were no longer able to produce; and 70 percent of public assets, especially transport infrastructures, were unusable,” said Papa. Consequently, the incumbent government set forth on a new system of actions and schemes, which saw a flurry of bridges, buildings, roads and schools built. Given this overarching cost-cutting approach, it may come as little surprise that many of the works in question were made with cheap or weak materials. But what may surprise some is that none other than the mafia aided in this unsavoury goal. “Mafia firms generally use poor materials and perform a shoddy job because their goal is to extract a quick profit,” said John Dickie, a professor of Italian studies at University College London and author of several books about the mafia. Many firms that worked with the mafia used unfortified concrete, a material that contains a higher proportion of sand and water than regular cement. As such, it poses a big risk to the integrity of associated infrastructure projects. “During core sampling analysis of tunnels and bridges, I have found cement blocks with a resistance three times weaker than the norm,” Nicola Gratteri, Catanzaro’s anti-mafia chief prosecutor told The Guardian following the Genoa incident. He also referred to several sites that were under investigation following their partial collapse. The works had been completed by the ‘Ndrangheta, a Calabria-based mafia organisation that has run riot in the region’s construction sector since the 1960s. Indeed, not only did the business become the group’s second-most profitable business (after drug trafficking), it also received government support when mafia boss Vito Ciancimino became Palermo’s head of public works in 1959. “The mafia problem undermines confidence in the ability of government and private enterprise to invest efficiently in infrastructure. Political corruption does the same thing. People assume that the money will be wasted or stolen, and so it is difficult to summon the political will to invest,” Dickie told World Finance. 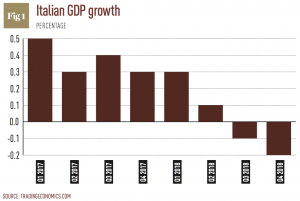 With incidents such as the Genoa bridge collapse making worldwide news, Italy’s anti-establishment parties have come out swinging, particularly with regards to spending restrictions enforced by the European Union. “We should ask ourselves whether respecting these [budget] limits is more important than the safety of Italian citizens. Obviously for me, it is not,” Deputy Prime Minister Matteo Salvini, who leads the populist, right-wing League party told the press in August. His statement, however, stands in stark contrast to previous claims made by governing partner Five Star. 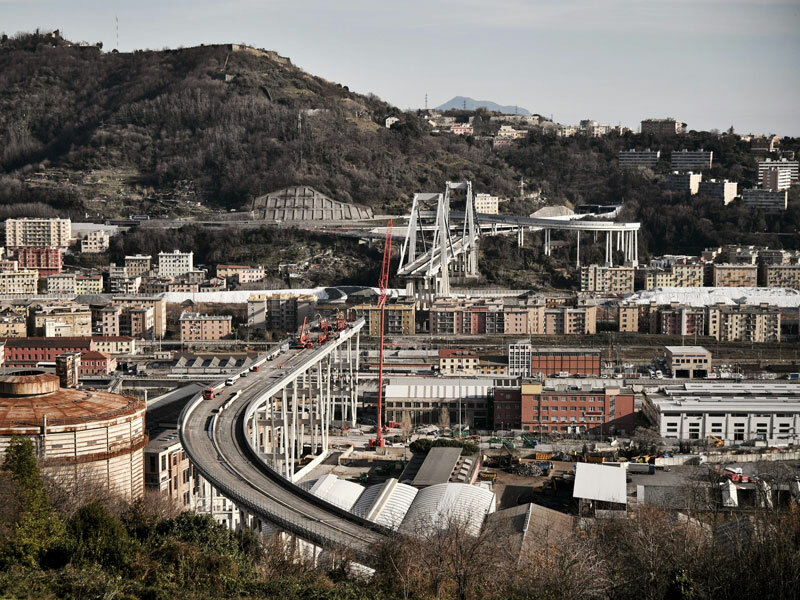 Part of the group’s early appeal was its opposition to pricey infrastructure projects, and in terms of the Morandi Bridge specifically, Five Star had dismissed warnings that the bridge was dangerous, referring to them as a “children’s tale”. This comment has since been removed from the party’s website and it has somewhat softened its anti-infrastructure stance, but continues to oppose the TAV despite pleads from the EU to stay on track. As such discourse illustrates, it would seem that unremitting finger-pointing continues to characterise Italian infrastructure. The Morandi Bridge, for example, saw repeated calls for repairs or a complete overhaul throughout the years, but conflicts between political groups and private companies about whether the spending was justified, and who should bear the cost, endured. In the end, profits were prioritised over safety. Adding insult to injury, the blame for the bridge’s avoidable collapse has shifted from one group to other. A considerable overhaul is needed. “On a social and political level, Italy needs to stop mourning; the country needs to regain the spirit of [the] 1950s and 1960s, with the desire to look to the future,” said Papa. “[The] populist government is, unfortunately, going towards the opposite direction. The recent discussion of the Turin-Lyon high-speed [railway] is an example.” On the technical level, Papa believes that Italy must define a new infrastructure plan, promote education in the field and place greater importance on new technologies. Simply, to prevent history from repeating itself over and over, Italy needs a fresh approach – one rooted in accountability and transparency. The involvement of criminal organisations and the highly ineffective system of subcontracting can thus be fleshed out. Following this, rebuilding and maintaining structures with sustainability at the forefront can occur. Certainly, undertaking this mammoth task across numerous sites and regions will cost the country billions – but taking shortcuts didn’t exactly work out the first time round.